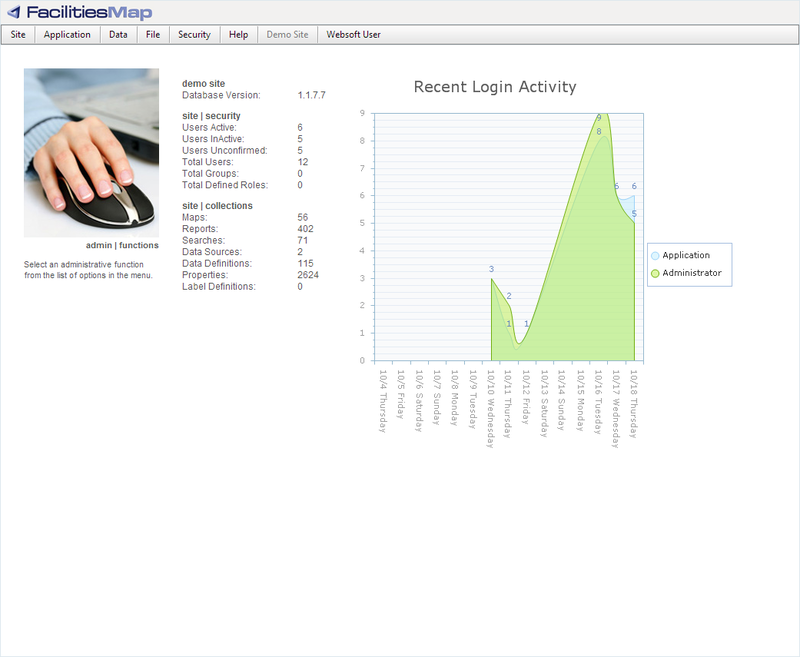 The FacilitiesMap Application has two interfaces: The Front End interface and the Administrator interface. This section addresses the Administrator interface of FacilitiesMap. In order to access the Administrator interface, the user must be granted access to the Administrator through the users, groups and roles options located under the Security Tab. Once the user has been granted permission to login in to the Administrator, they will be presented the initial screen presented in Figure 1. Initial Login Screen. The initial screen provides the user with a menu for modifying all of the settings associated with the site. The main screen provides the administrative user with various statistics including number of active users, inactive users, and number of: maps, reports, searches, data sources, data definitions, properties and label definitions.